So far Editor M has created 143 blog entries. If you were able to catch our recent production of Once we hope you enjoyed the Irish comforts from the music to the on-stage pre-show pub experience. We also hope you saved room for dessert because the Chocolate Guinness Cake was melt-in-your-mouth delicious! The Playbill Dining Room is wonderful from the soup to the decadent desserts, so keep your eye on the ever-changing menu – everyone is welcome! Thank you to Pastry Chef Ally Taylor for sharing the recipe for the glorious Chocolate Guinness Cake served during the Once buffet! Preheat oven to 350 Grease 9” springform pan with butter and line the bottom of pan with parchment paper. Heat Guinness, butter, cocoa and sugar over medium high heat until mixed together. Let cool to room temperature. In another bowl beat sour cream, eggs and vanilla until very well combined. Add the butter stout mixture and whisk together. Mix Bailey’s Irish Cream into whip cream to top your cake if desired. 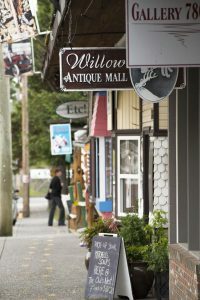 From February 9 to March 10, visit Chemainus Theatre Festival and see the winner of 8 2012 Tony Awards® including Best Musical. Emotionally captivating and theatrically breathtaking, Once draws you in from the very first note and never lets go. It’s an unforgettable story about going for your dreams and the power of music to connect us all. Once is a story built on chance meetings and the connections that can form through the people who come into our lives unexpectedly. As an audience member the experience begins from the second you walk into the theatre. 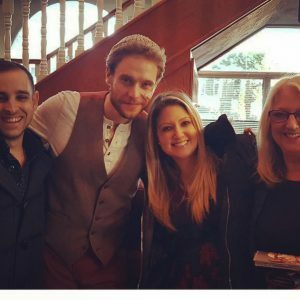 Instead of taking your seats and perusing the program as usual, you connect with the show and the cast right away – the stage is built to extend out into the audience, breaking down that invisible fourth wall that is so often experienced in live theatre. There is a bar set up on stage, not merely a set piece of an Irish Pub, but a functional bar where audience members can purchase a pre-show beer or glass of wine to enjoy on stage while the cast comes out and has a music session! This is as close to an authentic, energetic Irish pub experience you will get this side of the Atlantic Ocean. The audience sits down, already knowing from that first experience that this will be a special play. All the elements weave together through the lighting, the set, and the music bringing you into the lives of the characters and connecting your heart to them. Although the plot of Once takes place over a period of less than a week we see through the characters how those who we only know for a short time can change us forever. 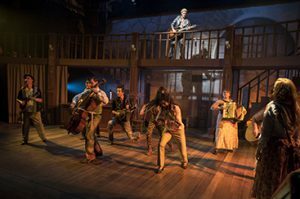 One of the beautiful things about this show is that the musicians are also the actors, always on stage, providing a rich, orchestral sound in an informal, personal way. The songs are unbelievably beautiful and integral to the plot and the feeling of the show. The music is almost a character all its own, a blend classic, folk, rock, Eastern, and Irish music – a truly soul-filling sound. 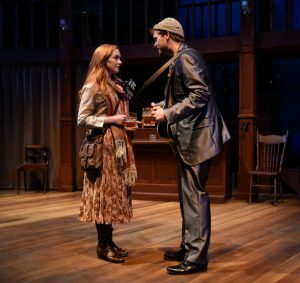 Chemainus Theatre Festival is proud of Once and the reviews have been positive. New for 2018 in addition to a variety of buffet options, Fridays nights are now featuring a ‘Table d’Hôte’ experience, having a selection of plated entrees while still experiencing the buffet salad and dessert. Delicious food and you can choose what suits you best. We can’t wait to welcome you in. Christmas is a time for people to come together and Chemainus Theatre Festival is proud to be a part of this tradition for the past 25 years. It is the talented directors, musicians, actors, and designers who come together to create the shows that bring friends and families coming back, again and again, to settle in a darkened audience and share a special story. Theatre can bridge gaps between people from different places, cultures, generations, and backgrounds. 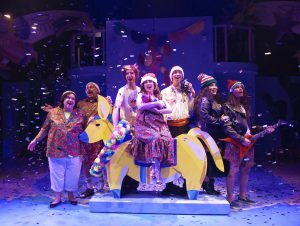 The ‘Cornwalls’ All-Inclusive Cancun Christmas’ is a sweet way to mark the end of a great year for Chemainus Theatre Festival – a joyous tale of a family coming together, sharing traditions, starting something new, and making friends along the way. Come spend an evening (or afternoon) at Chemainus Theatre Festival and enjoy the ‘Cornwalls’ All-Inclusive Cancun Christmas’. Time, budget, work, family won’t allow everyone to get away to Mexico this Christmas (it took Harry and Judy Cornwall 25 years to get there) but allow us to take you away on a musical journey to the mid-1980s with some of your favourite Christmas and retro tunes along with a whimsical story of a family doing their very best to create a memorable Christmas holiday vacation. Come to laugh and leave with a song in your heart. ‘Cornwalls’ All-Inclusive Cancun Christmas’ runs until New Year’s Eve with a fabulous buffet to rival any Mexican all-inclusive resort. Tickets go fast for our Christmas shows so book yours today. 2017 was a banner year for the Chemainus Theatre Festival. After all, it was our 25th Anniversary and we had a wonderful community celebration with music, tours, dress-up, ice cream and more! Our summer show, ‘Rock Legends’ broke a 9-year box office record and we explored classic love stories, children’s adventures, distant galaxies, and tales full of love and laughter. It is hard to not get excited about the 2018 season; it’s easy to imagine yourself in your favourite seat of the theatre for any of these shows. To kick off our season perhaps you will enjoy a special escape to watch a young couple find love in a Dublin bar in ‘Once’, or share cross-cultural family challenges in ‘Kim’s Convenience’, or laugh with/at the delightful ‘Glorious!’ Florence Foster Jenkins. 2018 will mark the 40th anniversary of the movie ‘Grease’ and many of us have a happy memory of bopping along with the tunes, whether it was during the original movie theatre release or perhaps at a pajama-clad sleepover in high school. Theatre can take you away and we invite you to come along for the whole 2018 season – maybe back to Ireland, in a rural county this time, in ‘Outside Mullingar’ or to a familiar but distant time with ‘Little Women’. There will even be a bonus show this year – we are re-launching our hit show ‘ Million Dollar Quartet’. Are you inspired yet? Don’t forget about the little ones – the summer run of our Kidzplay ‘The Little Prince’ will plant a seed for the lifelong love of theatre for many children this summer. We welcomed a new Executive Chef in our kitchen, Nick Caulford, in late 2017 and if you have dined in the Playbill Dining Room recently we are sure you will agree that his dishes are inspired. For our 2018 season, we are trying something new, on Friday nights only we will have a new service, Table d’Hôte. For this special service, you will enjoy a multi-course dinner with your choice of four special plated entrees inspired by the season and the show. The salad and dessert buffet will remain the same and we promise not to judge if you go back for a second piece of cake! With tickets starting at $25 and an option to get 4, 5 or 6 show packages you can customize your season to suit your tastes, budget, and calendar. Call soon to get your choice of seats and dates and best of all, if you purchase a season ticket subscription by December 8 and you be entered to win a Theatre Extravaganza Trip for 2 to New York. The Chemainus Theatre Festival is saddened to announce that its founder, Kenneth O. Smith, passed away peacefully on November 14th, 2017 at the age of 90. Ken was the driving force behind the founding and development of the Chemainus Theatre in 1993 and, with his wife Ruth, stood faithfully behind it, seeing it through to present-day maturity. He was passionate about theatre and inspirational to artists and staff, while serving many years as Board Chair. Ken played a lead role in all of the Theatre’s campaigns and capital projects over the first 25 seasons – including the construction of the Theatre’s Production Centre and the development of the Chemainus Best Western Hotel. Ken’s substantial impact on the arts and artists in BC carries on through the creative and artistic role Chemainus Theatre Festival plays in the arts and culture sector. The Theatre has grown to become the third largest producing theatre in British Columbia, drawing 75,000 theatre goers per year. Over its first 25 seasons, over 4,000 artists, actors and directors have worked at Chemainus Theatre while creating theatre for over 1.3 million attendees. Ken’s legacy stretches beyond Chemainus Theatre to include instrumental roles in the founding of Regent College at UBC, Pioneer Camps (Thetis Island and Chehalis), Honeymoon Bay Retreat Centre (Honeymoon Bay) and the Calling Foundation in Vancouver. His last public outing was attending the Theatre’s 25th season celebration on June 23rd 2017 and we will forever cherish the long and enthusiastic standing ovation that the packed house gave Ken when his enormous contributions were recognized. Rest peacefully, Ken. We will miss you and always be thankful for the impact you’ve had on our lives and the great opportunities that your faith and generosity have afforded us.